Gadacz, René R.. "Treaty Day". The Canadian Encyclopedia, 06 November 2018, Historica Canada. https://www.thecanadianencyclopedia.ca/en/article/treaty-day. Accessed 21 April 2019. 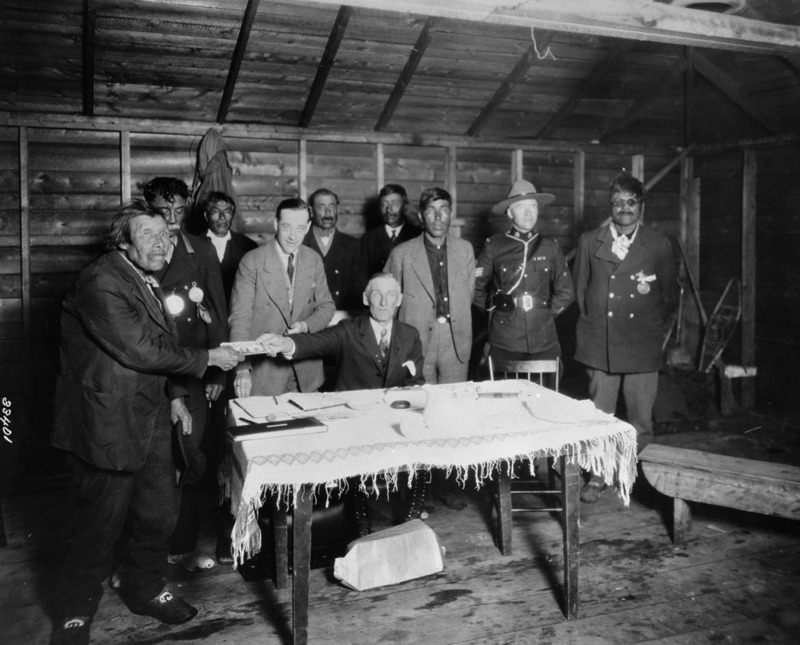 Indigenous peoples receiving treaty money, 1930. 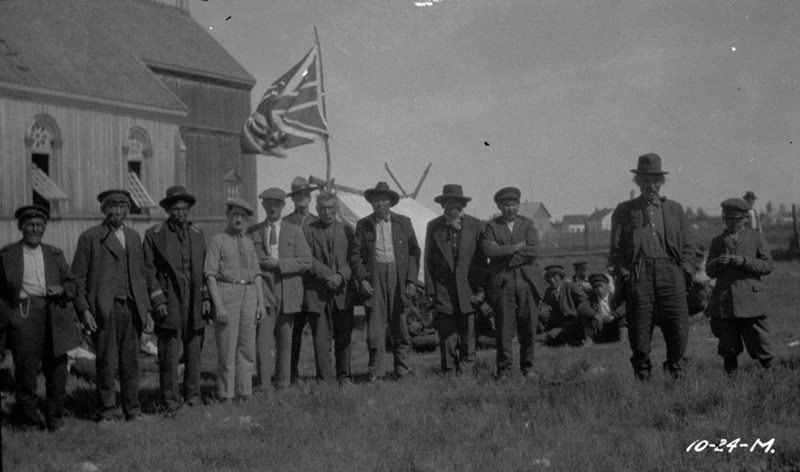 Paying Treaty, Fort Resolution, NWT, circa 1924. Treaty Day honours the nation-to-nation relationship formed between the federal government and various Indigenous nations, as enshrined in historic treaties. In Western Canada, Treaty Day also commemorates the annual meeting at which representatives of the federal government distributed treaty payments to members of Indigenous bands who signed the Numbered Treaties. The first of these annual payments was in 1872 and they are still distributed to this day, although now they are mostly a symbolic gesture. Most descendants of the Numbered Treaties signatories receive $4 or $5 annually — an amount that has not increased over time to reflect inflation. Therefore, these minimal funds are financially insignificant but they confirm the relationship between Indigenous peoples and the government. In Nova Scotia, Treaty Day has a slightly different meaning. There, Treaty Day commemorates the signing and significance of the Peace and Friendship Treaties of the 1700s (see Indigenous Peoples: Treaties). These treaties brought an end to years of warfare between the Mi’kmaq and the British. Although there is no distribution of annual payments, Treaty Day in Nova Scotia commemorates the Indigenous rights of the Mi’kmaq people and their relationship to the Crown. Despite these differences between celebrations across Canada, Treaty Days are annual celebrations where the descendants of Indigenous signatories honour these historic commitments. Treaty Day is celebrated on different days throughout Canada, depending on the particular treaty that is being commemorated. For example, 1 October 1986 was proclaimed as Treaty Day in Nova Scotia and since that time has been celebrated annually to recognize the connection between the Crown and the Mi’kmaq, and to commemorate the Peace and Friendship Treaties. In the West, Treaty Day or Treaty Days (also known as Urban Treaty Days, which generally applies to all Indigenous nations in the region regardless of treaty affiliation) is celebrated in the summer months in Saskatchewan, Manitoba and Alberta. For the Indigenous peoples of the West, Treaty Day commemorates the treaties between the federal government and Indigenous nations. Aside from Nova Scotia, provinces and territories do not have a specific day on which to celebrate the signing of historic treaties. However, Indigenous nations that were promised annual payments in the Numbered Treaties and in the Robinson-Huron and Robinson-Superior treaties still receive those payments from the federal government. Oftentimes, these cash payments are made in person, directly from a representative of the federal government. Lack of a provincially recognized Treaty Day also does not prohibit Indigenous peoples from commemorating historic treaties in their own communities. For instance, Mi’kmaq and ​Wolastoqiyik​ (Maliseet) communities in New Brunswick, Prince Edward Island, Québec and Newfoundland and Labrador celebrate the Peace and Friendship Treaties. The peoples of Treaties 8 and 11 (covering parts of the present-day Northwest Territories, Yukon, British Columbia, Alberta and Saskatchewan) have been holding annual celebrations of treaty payments since the treaties were signed in the summers of 1899–1900 and 1921, respectively. The anniversaries of modern treaties, such as the 1975 James Bay and Northern Québec Agreement, are also celebrated within specific communities. In some cases, efforts have been made on the part of both Indigenous peoples and governments to bring greater awareness to treaty history and treaty peoples. In many parts of Canada, historic treaties are celebrated as part of National Aboriginal Day on 21 June every year. In 2016, as part of Ontario’s commitment to reconciliation with Indigenous peoples (see Truth and Reconciliation Commission), the province declared the first week of November as Treaties Recognition Week. In Nova Scotia, Treaty Day is celebrated with powwows, dances, parades, concerts, speeches, feasts and other social and cultural gatherings. The same is true in Western Canada, although they also celebrate Treaty Day with the distribution of annual payments. The amount of the payment depends on the agreement stipulated in the treaty. These cash payments can be distributed on or off reserve. In the past, government officials would distribute food, ammunition, clothing, hunting and fishing equipment and other goods, in addition to monies. Although many treaty promises have remained unfulfilled by the federal government, Indigenous communities still believe in the importance of commemorating the historic relationship between treaty peoples and the federal government. 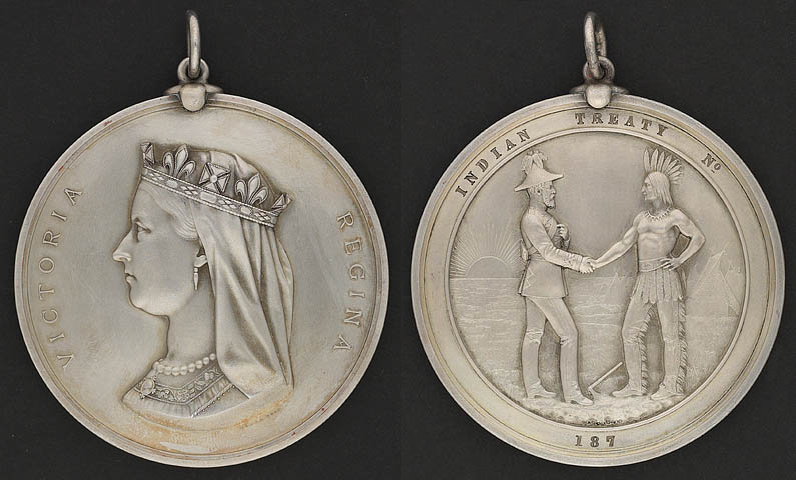 Today, some dignitaries wear replica treaty medals to the festivities as a way of honouring these binding commitments. Treaty Day also brings families and communities together in celebration of Indigenous culture and heritage, while reaffirming Indigenous and treaty rights (see Rights of Indigenous Peoples). Both sides of a commemorative coin, Chiefs Medal, presented to commemorate Treaty Numbers 3, 4, 5, 6 and 7. Brass treaty medals from Treaty 7, 1877. 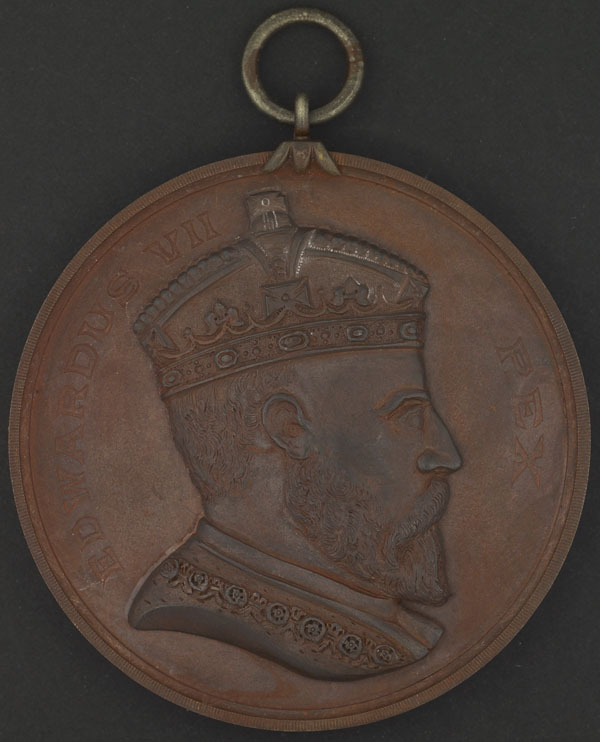 Image of King Edward VII on one side of a treaty medal, presented to commemorate Treaty 10, 1906-1907. R. Fumoleau, As Long as This Land Shall Last: A History of Treaty 8 and Treaty 11, 1870–1939 (1975). Michael Asch, On Being Here to Stay: Treaties and Aboriginal Rights in Canada (2014) and (ed.) Aboriginal and Treaty Rights in Canada: Essays on Law, Equality, and Respect for Difference (1998). René Fumoleau, As Long as This Land Shall Last (1973). Historic Treaties The site contains historical research reports, images, maps, bibliographies and other resources pertaining to the more than 70 historic treaties negotiated between 1701 and 1923. From Aboriginal Affairs and Northern Development Canada. Traités historiquesLe site contient des rapports de recherche historique, des images, des cartes, des bibliographies et d'autres sources d'information sur les nombreux traités historiques négociés à partir de 1701 jusqu'en 1923, qui se chiffrent à plus de 70. Par Affaires autochtones et Développement du Nord Canada. Affaires autochtones et du Nord CanadaEn apprendre davantage sur le paiement des annuités prévues dans les traités.